Plaque and tartar had built up around the neck of his teeth, causing gum pain. 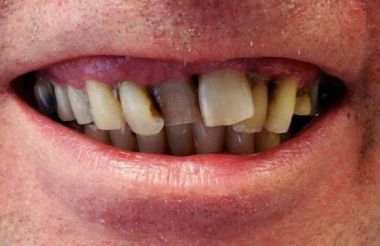 This middle-aged, heavy smoker patient's bridge was cracked and his teeth were in a bad state. His gums were also very sensitive and often bled. he couldn'tafford to receive implant treatment in the UK. recession, and some of his teeth were very loose to the touch..
Our partner dentists diagnosed severe inflammation in the surrounding gum tissues and bone which contributed to his partial tooth loss. 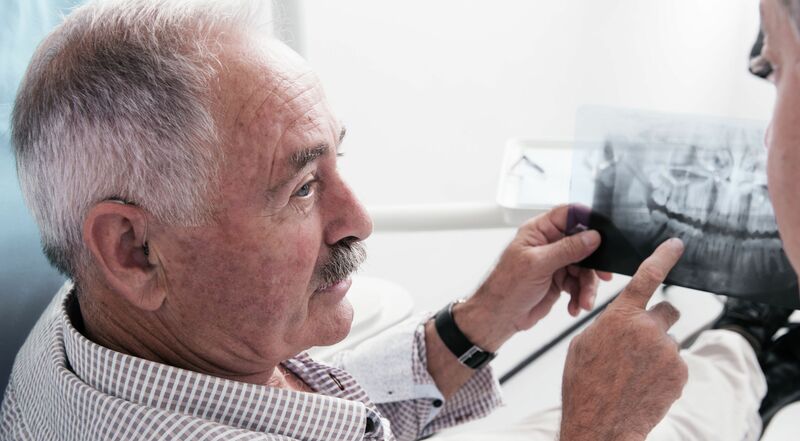 The extensive bone loss would also lead to further teeth loss and the patient was more likely to become completely edentulous (toothless) in the future. After extraction, the inflamed gum tissues were removed and the infected areas were cleared up. The patient received 11 immediate loading implants (BCS implant) in the upper jaw and 10 BCS implants in the lower jaw. A 14-unit bridge in the upper jaw and a 12 unit bridge in the lower jaw were put in place. We also gave him strict instructions about how he can save his implants and teeth, as he's not likely to stop smoking.